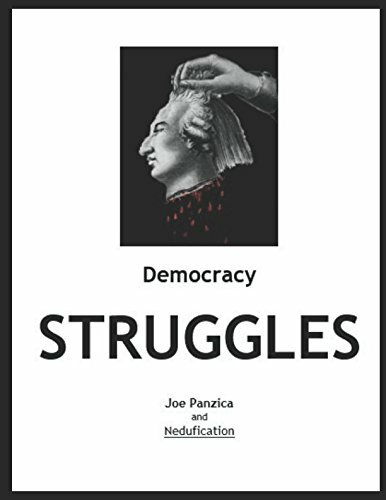 Democracy Struggles covers the birth of the United States relationship with democratic ideals from 1789 to the present. It is 172 pages, 13 Chapters with 103 Color Illustrations, 7 Graphs, a Vocabulary Break and Review Segment. Recurring themes are the survival of the populace, issues of trust and conflicting realities merged with a focus on an idealized self. It speaks to the issues inherent in the attempts for harmony and equality while it questions whether either are possible as both lay beneath the veil of classism and racism. In my opinion we have always had both so it is a worthy question. Democracy Struggles walks the reader thru the development of modern democracy by focusing on the significance of language, its inherent value and complexities in interpretation as he draws out the distinction between "personhood" and "dependence" (115), addresses many an archaic conflict encased within the defining moments of challenge regarding absolutism (58) including the impact of efforts those in power have in controlling populations enforcing the inevitability of uprisings in concert with freedom and the nature of resistance. The transcendent value of opposition follows this book from page to page. It speaks to the reader in Historical tones encapsulating philosophical, ethical and moral perspectives reminding us of the pitfalls of leadership once challenged by the transparency of motivation behind the aspirational goals of unity in opposition to the present-day obstructionism and deconstruction of civil rights, as the U.S. goes thru an identity-crisis. He asks you to consider "When you would say were the best of times and the worst of times from the Roman Empire to the possible impeachment of dumvald trump?" And draws out attention to its influencers: Nietzsche, Dickens, Thomas Jefferson, Louis Capet, James Madison, Alexander Hamilton, the Bill of Rights, the U.S. Constitution wondering if equality is possible as he introduces a review of "dreams that make us and refers to the "peak and flow experience" of an ever-changing democratic system as all systems shift under the most promising intentions for better and for worse. The vocabulary sections make certain you understand the meaning of exploitation, democracy, liberalism, republic, federal, nationalism, Greek Democracies, Athenian Democracy and more. Democracy Struggles is speaking to the sixteen plus year old student, the young adult activist, work-study groups and youth organizations. But make no mistake, he is also speaking to the older adult interested in the progression of conscience as a primal aspect of politics continually merged and challenged thru the visages of time by the changing trends and fears of the future. He wonders at the toxicity that binds the collective conscious and unconscious in politics combined with an ounce of suspicion coupled with anxiety regarding the possibility we are by virtue of democratic principle "domesticating" ourselves and wonders if cultural evolution affects biological evolution? Democracy Struggles is a most valuable tool in understanding the magnitude of the challenges in our past, present and future calling the reader to bring themselves fully to the table of discourse and commitment to the discussion.